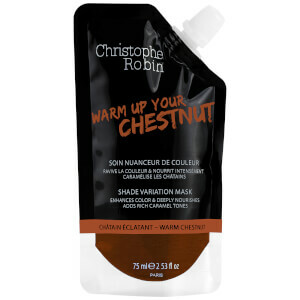 Rejuvenate your brown hair with the Christophe Robin Shade Variation Mask in 'Ash Brown', a nourishing hair mask that works to restore the warmth back into colour-treated, highlighted or naturally brunette hair. Neutralising the effects of oxidation, the deeply nourishing mask helps to eliminate unwanted red and mahogany tones, replenishing warmth and radiance back into dull brown hair. Creamy and nourishing, the colour care treatment contains Buriti Oil to help revive vibrancy, and Almond Butter to nourish and protect. After use, brunette hair looks rich and healthy. Free from parabens, silicone, oxidant and ammonia. Warning: Make sure you only leave the product in for 5 minutes the first time you use it to test how the pigments interact with your hair. Carry out a patch test 48 hours before application to avoid any allergic reactions. Wash hands immediately after application to avoid staining your nails. Avoid contact with eyes.